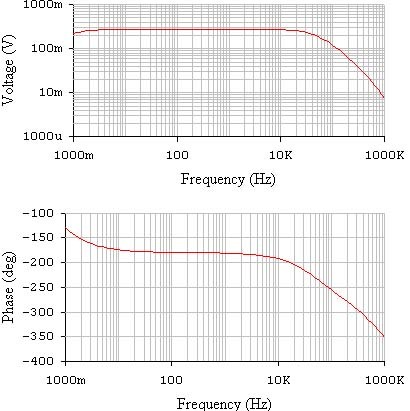 The articles: "The influence of schematics on power amplifier parameters" and " Yet some more schematics of power amps" describe some schemes widely used by power amplifiers manufacturers. As I promised here are some more. As a matter of fact, no amplifier can be built without negative feedback, because emitter-follower is a 100% negative feedback device. So the correct name of these schemes is "the amplifier without general negative feedback". This is an extremist case of the second way of power amplifier design. What are these two ways? The first one is to make the open loop gain high to make the deep negative feedback. The deep NFB makes it possible to lower the distortions of the initially nonlinear device. This way has some shortcomings. The gain becomes lower at higher frequencies so distortions grow. So the open loop bandwidth is to be made higher and the unity gain frequency grows too. So the "audio amplifier" becomes a RF device (liable to RF interference for instance). Almost all described schemes are the results of such approach. The second approach is in linearization of every single stage and lower overall open loop gain. 10 - 30 dB feedback is common for such amps. The extremist way is to have no general NFB at all. The shortcomings here are of different nature: it is hard to make the output voltage drift or output resistance low enough. All the notes from the foreword of the part one of "The influence of schematics on power amplifier parameters" are applicable to the schematics below. The complete schematics of the amp can be seen on the Scandinavian company site: http://www.lcaudio.com/temil.htm. Most interesting thing is low THD. I have simulated the amp using SPICE models of BF471, BF472 transistors instead of those hidden under the pseudonyms: S1D and S2D in original schematics. Sure the guys from L C Audio can say that this fact as the fact that there are no MCAP capacitors in the schematics here make the results of simulation incorrect, but You have what You have here. It differs from the original by the absence of short circuit protection, it is trigger type and has no influence on THD. The amp has two stage symmetrical design described earlier. The output stage is a four transistor emitter-follower in which the Darlington transistor used as diode to linearize it. The DC servo differs slightly from the original one. We see, that the phase shift at 20 kHz is lower than 2 deg. (1.3) and the frequency response (-3 dB) is 1.4 mHz. Everything is OK till now. Nothing like 0.0017% at -3 dB! The output transistors quiescent current is 20 mA. If quiescent current is 250 mA THD are reduced to 0,134% at 100 mV input and grow to 0.44% at 500 mV. It is good that THD are not related to frequency. There is a minimum of THD at a certain value of output transistors quiescent current, which is usually not the fact in amps with NFB. This minimum is at 43 mA in our case. If it is lower the THD are lower at 1 kHz and slightly higher at 20 kHz. It can be seen that it looks good and the slew rate is very high. It should be mentioned that the damping factor "measured" by EWB was about 50 (47.6 to be precise),that means that the scheme was simulated correctly. They tried hard but could not make THD be lower than 0.1%. The parameters of this amp are much higher than of any tube amp. The THD are several times lower and frequency characteristics are very much better. This scheme was published in Soviet "Radio" magazine and now many Russian i-net sites contain it (the author doesn't know about it, I'm sure). The original amp had unipolar power supply, we make it bipolar. All the transistors were of Soviet origin, I use those used in all other amps. Special transistor shunt (Q15, Q10, R21, 22, 27, 28, 29, 30, 31, 32) is used in four transistor output emitter-follower. This shunt is to reduce THD. The amp has symmetric input follower on Q1, Q2 and symmetric second stage with current mirrors: Q3, Q5 and Q4, Q6. The second stage is the only voltage amplifier stage of the amp. R9 is for AC balancing of the amp, but could not't find any influence of the setting of this potentiometer on THD. But the value of this potentiometer has such influence, but I left it as it was. As I increased the power supply voltages I had to adjust the output transistors quiescent current with R26* (it increased compared to original schematics). R17* is for DC balancing. The THD of the amp with and without shunt are shown in the table. 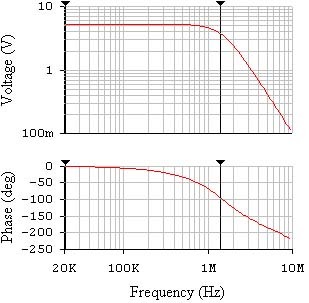 The THD have minimal value at a certain value of output transistors quiescent current. These optimum values differ for schemes with and without shunt and are respectively 69 and 133 mA. The voltage gain of the amp is only 2.7. It can be seen that the shunt works, especially on high amplitudes and its influence is more evident at higher frequencies. The THD are rater high, but it would be interesting to experiment with shunts in amps with NFB. As we see the graphs look the same. The frequency response is 20 kHz or slightly higher. As I altered the DC modes the THD may not be minimal. Maybe the adjustment of the shunt resistors values could decrease THD. But still they are high.